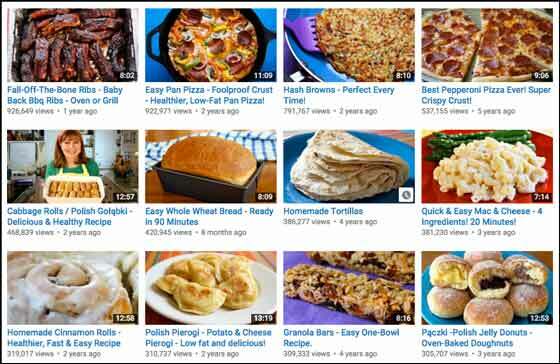 When I started posting my cooking videos on youtube, I had no idea how popular they’d become. I did it just for fun because I love to cook and people always asked for my recipes. I’ve made almost a hundred videos now and they want more! I’ve had over ten million views so far (10,249,165 views as of today) with around 25,000 people a day tuning in. Who knew? And it’s international. People all over the world are making my recipes… from 197 countries! From Iceland to Brunei to Tanzania, they like my cooking. They write to me in broken English and sometimes in Spanish or Polish or Greek. I love it! And here’s the best part: Some people are using my recipes to earn money to help support their families. ~ Maria in Mexico sells my granola in little bags to earn money. ~ Chin Chin in Thailand sells my whole wheat bread to help support her family. ~ Marcio in Brazil sells my pan pizza and hash browns in his pub. ~ Carmen in Ecuador sells my cinnamon rolls to help provide for her children. It sure feels good to know my recipes are helping people, not to mention that hundreds of thousands of people have made and enjoyed my recipes at home, wherever they are. What are the most watched videos? My fall-off-the-bone ribs; then pan pizza; followed by my hash browns. Yes…. hash browns. I never saw that coming! I’d like to thank whoever invented the internet for allowing me to share my love of cooking with the world. Who was that? Was it really Al Gore?